Eat Clean Egg Scramble was posted on August 8th, 2011 and is filed under Breakfast, Dairy Free, Gluten Free, Recipes, Vegetarian. This entry has 11 comments. You can follow any responses through the RSS 2.0 Comment Feed. I feel like I can finally say that eating protein isn’t a problem for me anymore. Of course, some days are harder than others to get it in…but I’m finding it SO much easier. And I feel better! My blood sugar levels are much more stable. I’m finding that with pairing a protein with every meal and snack makes me much more satisfied…I’m not craving food as much, because I’m not as hungry. And here’s the biggie! I’m not succumbing to sweets as much. A couple days ago my thoughtful sister brought me home one of my favourite chocolate bars. I actually managed to refuse it and told her to enjoy it instead. Me! Refuse chocolate! It’s a miracle. Of course, not sure that protein has anything to do with that remarkable example of will power. I love starting the day with protein. 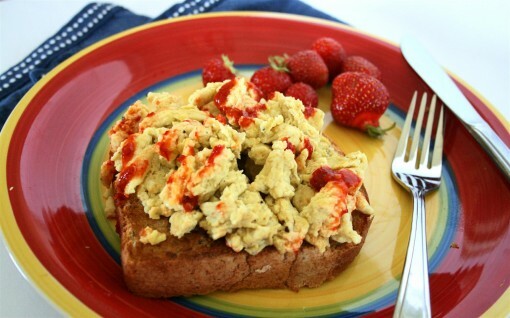 Here’s one of my favourite dairy-free egg scrambles. The nutritional yeast gives it just a subtle cheddar flavour, which I love. For one and a half tablespoons of nutritional yeast it has 8g of protein, which is another reason I like to add it to my meals (plus, it has a ton of B vitamins which help give us energy!). Whisk all of the ingredients up in a bowl. Cook in your frying pan (lightly mist it with olive oil). Serve on whole wheat toast with hot sauce or salsa. Serves 1. This week will be a flurry of crazy fun activity…my brother, his wife and their nine kids (yes…nine!) are having their vacation time with us for a week! We’re going to hike, tube down the river, play games, do volleyball, eat watermelon, and hopefully sleep in, lol! The softball tournament (SO much fun) this weekend and then playing volleyball all afternoon & evening after church yesterday has left me a little…sleepy. But this is what summer is for, right? What do you enjoy starting your day with? Any fun ideas for this week with all my nieces and nephews? That looks pretty tasty. I love eggs, but rarely eat them because it takes too long to prepare. But as you show here, it really doesn’t take that long at all. Yummy :D I love eggs. I’ve been going crazy on them lately, they seem like the perfect hot weather protein because they don’t take long to cook. Love the nooch, I can’t wait to try that. Actually I can’t believe I’ve never tried nooch with eggs! 9 kids?! That sounds like so much fun :D Have a great time! My favorite part is how you give it a little kick with the cayenne pepper. Great idea. I love a great protein packed breakfast. We always seem to have better days when we start them with great foods. 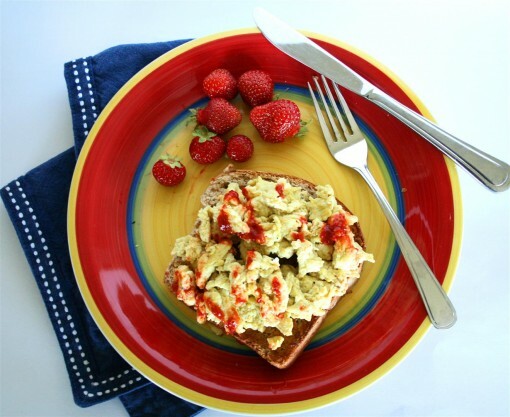 I love starting my day with healthy meals like this — sets me up for healthy eating all day! :) Hope you have a wonderful week with your family! Wow, you are going to have an exciting and fun-filled week…that’s interesting! I love eggs and the picture displayed here looks so tempting, dear!